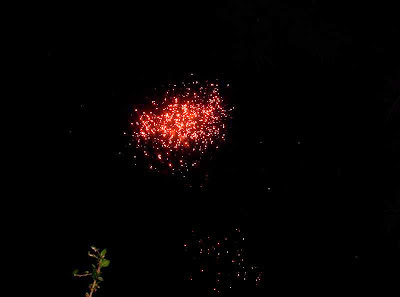 The Mumbai sky as seen on 20Jul09 at 1921hrs. A view of the Mahim Nature Park. The green cover that we are losing and need to protect. Old giving way to new at Parel in Central Mumbai. Part of an ancient cannon at the Bhau Daji Lad Museum in Mumbai. This year the monsoons in Mumbai arrived late due to which the lakes supplying water to the city were drying up. This resulted in severe water shortage and restricted water supply, leading to people using all available utensils to store water in homes. Fortunately with the arrival of the monsoons the situation has improved and the lakes are filling up! The Mumbai sky as seen on 20Jul09 at 1909hrs. The Asiatic Society of Bombay is based in Mumbai, India. It can trace its origin to the Literary Society of Bombay which first met in Mumbai on November 26, 1804, and was founded by Sir James Mackintosh. It was formed with the intention of "promoting useful knowledge, particularly such as is now immediately connected with India". After the Royal Asiatic Society was established in London in 1823, the Literary Society of Bombay became affiliated with it and was known as the Bombay Branch of the Royal Asiatic Society since 1830. The Bombay Geographical Society merged with it in 1873 followed by the Anthropological Society of Bombay in 1896. In 1954, it was renamed the Asiatic Society of Bombay; it acquired its present name in 2002. It is funded by an annual grant from the Central Government of India. This is on the flyover at Lower Parel which was, till a decade back, a predominantly textile mill area. The flyover did not exist then. Now the area is known for shopping malls, corporate offices, restaurants and amusement areas employing quite a few of those people who lost their jobs when the textile mills closed. Marine Drive in monochrome on 18Jul09 at 1742hrs. Performing aquatics for an audience! The Mumbai sky as seen on 10Jul09 at 0631hrs. Imagine the amount of Power in that engine which will lift off that aircraft and fly it thousands of miles and the Power of that tractor which pulls/pushes that aircraft on ground! The Mumbai Chhatrapati Shivaji International Airport at midnght. Executing a perfect landing on such a short landing strip! Gulls sitting amidst garbage in the Mahim creek adjacent to the Maharashtra Nature Park. The Mumbai sky as seen on 02Jul09 at 1904hrs. 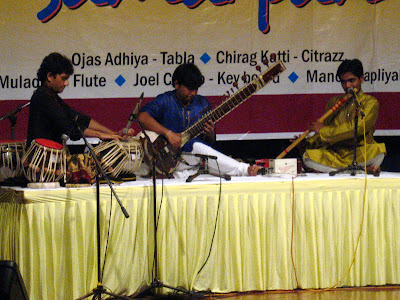 Young 'Hindustani Classical' musicians performing at a concert in Mumbai. 'Shiv Sena Bhavan' - the headquarters of Shiv Sena, a powerful political regional party of Maharashtra with national ambitions, is in Shivaji Park, Mumbai. The person pictured on the building is their founder, Bal Thackeray. He has now handed over the reins of running the party to his son - Uddhav Thackeray. A bird in flight at the Maharashtra Nature Park in Mumbai.